This dress is called a PAVADA DAVANI. 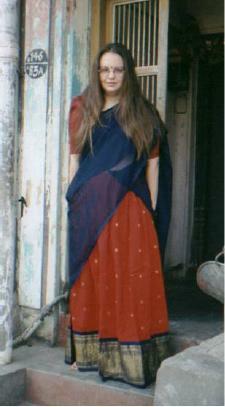 It is three pieces- a long skirt, a choli blouse and a long 'dupetta' scarf, called a half- sari. Some just call this dress as half-sari. Usually this dress is actually four pieces, as it is modest and proper to wear an underskirt underneath the outer drawstring skirt. This dress is usually worn in villages in Tamil Nadu, as young girls in cities prefer to wear either Salvaar Kamiz or western clothes. This dress takes an art to wear, like the sari, as the 'dupetta' tied like the top of a sari should not expose the chest from top or bottom. It is customary for girls from age of 13-19 to wear this. I was obviously 'too' old, but I wanted to try it out! I prefer sari over all! Another note- this dress is in North India, but it is known as lengha. There are slight differences, but basically the same dress.